A film about the director of the worse movies of all time would be ripe for criticism. It would be easy to parody, mock or worse, play far too seriously but luckily Tim Burton knows exactly how he wants the movie to be created – as if it was made by Ed Wood himself. This means that it is shot in black and white, there is some at times dodgy over-acting and some of the shots mimic those that were popular in the 1950s, when Ed Wood was making his movies. On paper this sounds like a terrible idea but it gives the movie a unique look, one not too far from the aesthetic that has become synonymous with director Tim Burton, as well as hiding one of the more problematic elements, the story is not that interesting. 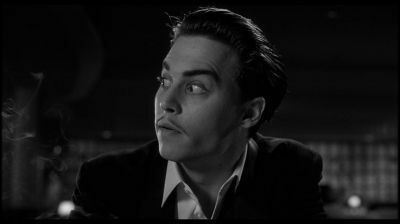 Is the life of Ed Wood worth a biopic? It is never boring but it is hardly a captivating feel-good tale or one which will inspire. Even people struggling to make it in Hollywood can’t really take the scatter-gun approach that Ed Wood did to his movies. There are some great scenes, including the premiere of a movie turning to a riot, the use of improvised “effects” in his most famous movie and the story behind the last performance of Bela Lugosi. Unfortunately there is plenty of filler in-between as well. Ed Wood did seem like a fascinating director and obviously had a lot of ideas and motivation, even if it didn’t always translate into talent. Tim Burton demonstrates this very well and Johnny Depp ably brings the character to life. Without knowing too much about the real-life inspiration for the movie, it is difficult to say how well Depp captures the man but he certainly puts in a performance that demonstrates why he became such a big Hollywood star today. It is also refreshing to see him without so much prosthetic and being forced to hide his face for his performance. The real star is Martin Landau, is almost unrecognisable as Bela Legosi. His is a more dramatic story, an actor who has been left behind by the industry, mainly due to age, and would arguably be the better subject of the movie as a whole, but his story does get a decent telling here. It isn’t that Ed Wood doesn’t get a good showing either, it is just that maybe there is a better part of his life to focus on. The story behind Plan 9 from Outer Space is a very interesting one but then the movie skips over his less impressive and more struggled final days in Hollywood, making movies most would not have heard of or be particularly proud of. Nevertheless, there could well be a good story behind those kinds of movies too. 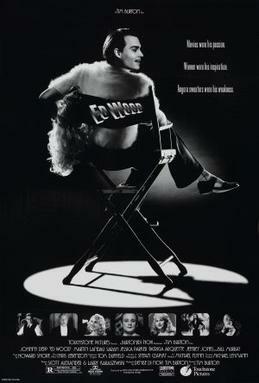 Overall, Ed Wood is a decent movie about a bad director but will hardly inspire anyone. It is a strange person to use for a biopic, with no great story to capture an audiences imagination. It does hold great performances, particularly Martin Landau as actor Bela Legosi. Does this really cover the director’s most interesting point in his life?